Senator for Buenos Aires province received by Communist Party leader, while on island to visit daughter, Florencia, who is receiving medical treatment. 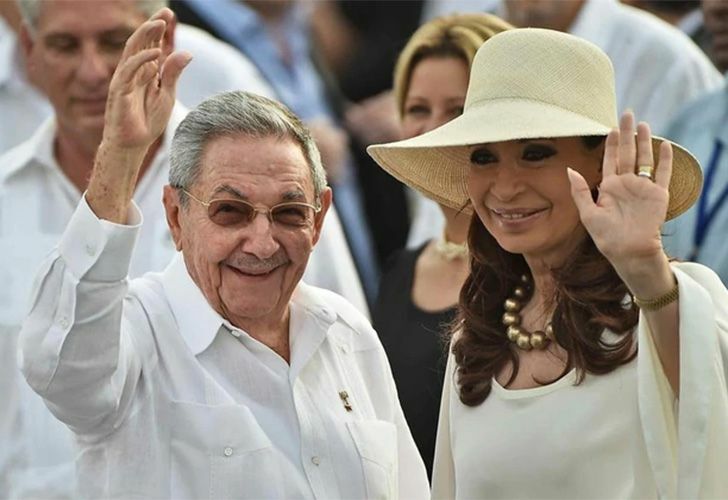 Cristina Fernández de Kirchner was received on Monday by Cuban leader Raul Castro for a private meeting, an official on the island revealed late last night. "Army General Raúl Castro Ruz, First Secretary of the Central Committee of the Communist Party of Cuba, received the senator and former president of Argentina, Cristina Fernández de Kirchner, on Monday afternoon," Foreign Minister Bruno Rodríguez revealed on Twitter. The Cuban government did not offer official comment on the meeting. Fernández de Kirchner, 66, travelled to Cuba last week to accompany her daughter, filmmaker Florencia Kirchner, as the latter undergoes medical treatment. Prior to her departure, the former president notified judicial officials that she would be flying to Cuba for seven days. Despite the raft of accusations in the courts against her, Fernández de Kirchner was under no obligation to notify the authorities if she was leaving the country. The former president arrived in Havana on March 14. She was welcomed by the foreign minister himself after landing at Havana airport. Both the former president's activities in Cuba and the details of the Florencia Kirchner's medical treatment have been handled with upmost secrecy ever since. On Monday, Fernández de Kirchner was charged in yet another corruption case, this time relating to the alleged overpricing of imports of liquified natural gas. The senator for Buenos Aires province, who has immunity thanks to her role as an elected lawmaker, denies the allegations and says they form part of a campaign of judicial and political persecution against her and her family. Last week, in a dramatic video posted on Twitter, Fernández de Kirchner said her 29-year-old daughter was suffering from "severe health problems" as a result of "the fierce persecution to which she has been subjected." Fernández de Kirchner and her two children, Máximo and Florencia, face money-laundering allegations in the so-called 'Hotesur case,' the investigation exploring a corruption ring centred on public works graft and the fraudulent rental of hotels rooms involving businessman Lázaro Báez. No date has yet been set for the trial. Prosecutors believe the Kirchner-owned Hotesur firm was used to launder money and pay bribes, through a corporate, economic and accounting structure that allowed the parties involved to launder illicit funds. The hypothesis of the investigation is that Báez lent the Kirchners money to buy the hotels and used Valle Miter to exploit them as mechanisms to launder money. According to the casefile, a total of 86 million pesos were paid by Valle Miter SRL to Hotesur SA for the payment of rental fees for rooms at various Kirchner family hotels, namely Alto Calafate, Las Dunas and La Aldea. "The persecution they have done on her and that has devastated her is because she is the daughter of Néstor and Cristina Kirchner," the former president claimed in the video released last week. Florencia’s father, former president Néstor Kirchner, died in October of 2010. If found guilty and handed a prison sentence in a trial, Fernández de Kirchner and her son, Máximo, would likely not go to jail. As sitting lawmakers, they hold parliamentary immunity. Florencia, however, would likely find herself behind bars.